Be sure to check us out on Instagram or Facebook for more frequent updates! 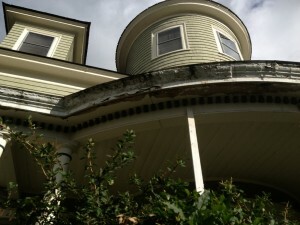 This curved porch is located in Barre. 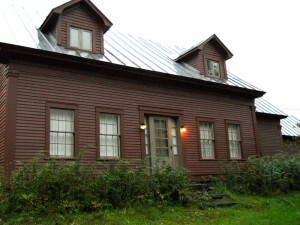 It is the former house of DeForest Clinton Jarvis, probably known to few, but he wrote a 1958 book Folk Medicine: A Vermont Doctor's Guide to Good Health. Anyway, the porch was trimmed out with short straight bits of crown moulding which may have looked ok at some point but were in a terrible state of disrepair. We removed all the old crown moulding and rehabbed the dentile area below it. The new curved crown moulding was constructed from laminated strips of wood which were glued up into a curve and then milled with the matching crown profile using a custom shaper knife which matched the old profile. There was also a lot of sheathing and framing repair. Re-roofing was also in the scope of work with new black drip edge. A difficult and challenging project but in the end a satisfying result. This work came about via a reference from a plumber. The customer had water damage to a wall from a plumbing leak. It provided the opportunity for a strand bamboo floor to replace the old carpet in addition to other upgrades. This project is an interesting one. I would describe it as a collaboration between us (the builders), the designer, the homeowner, two painters and a heating systems company. The job has many aspects to it. After a structural assessment we addressed a few support issues in the basement with new footers and posts. We replaced a number of large double hung windows in terrible shape with new Marvin full replacements. We duplicated the historic trim inside and out and one painter did a fantastic job matching the trim to the old mahogany. We have performed numerous floor patches to match the old floor as the old radiators have been replaced. The new heating system is a Pellergy boiler with Runtal low temp panels that operate at 140 degrees. The heating project has been mostly the brainchild of the homeowner and heating company and will also include solar panels. We have altered closets and walls. The project also includes a full kitchen remodel. It's been a while since the last post. It was quite a busy summer and fall. Still busy with interior work. Kitchen renovation, half bath addition, full window replacement matching historic trim, helping rehab and renovate a neglected farmhouse. Pictures coming soon. This project is located in Montpelier and consists of renovating the 3rd floor of house that will one day be a mother in-law "suite". 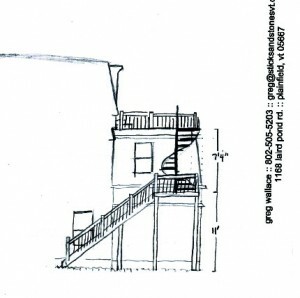 We are adding exterior access to a 3rd floor space via a combination deck, spiral stair and wooden stair. The 3rd floor is to be finished and a 3/4 bath and small kitchen added. 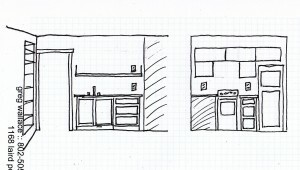 The sketches below are an example of the quick working drawings we do to help a customer visualize what things could look like. 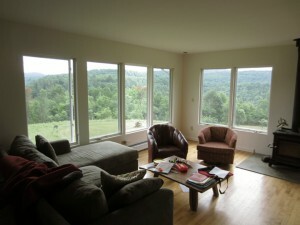 This 1970's ranch is located up high with an amazing view across to some wooded mountains. The main focus of this project was to replace the current windows with much longer ones. The new 63" high casement windows extend down to about 14" above the floor, providing a nice sweeping view. The windows on the south side of the house have a coating that allows much more solar gain than a traditional low-E coating to help lower heating costs. The master bedroom and living room each have a triple set of 37"x63" windows. Additionally we will be added a partition wall and moved a few others to create a new bedroom and a mudroom. 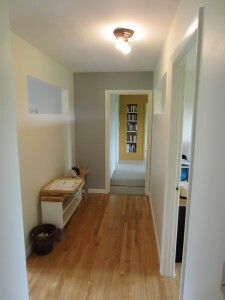 We added transom windows on either side of the hallway in the office and mudroom to help open up the space. We also built several built-in bookcases with the same modern no trim style as the windows. 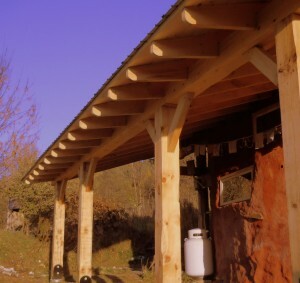 Timber porch addition to cob house. 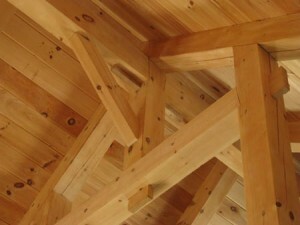 Locally milled pine timbers and rafter stock. V-groove ceiling boards and metal roof. Steel brackets for post bottoms fabricated by Bauer Fabrications in Waterbury, VT.
We recently traveled to Tinmouth, Vermont. The occasion was Solarfest. It was a a very engaging weekend. I gave a timber framing workshop and had a great time chatting with other people about solar collectors, composting toilets and hempcrete. One of the other highlights was riding an electric bike. 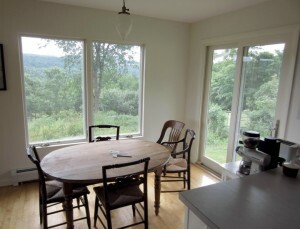 We are currently working on a farmhouse renovation in Washington, Vermont. Tearing off the old cracked and rotten clapboards and adding housewrap and foaming all of the window and doors around the jambs and foaming in places that did not get insulated well when the cellulose was blown in 10 years ago. We are saving the trim in a few areas. It is amazing how well old growth spruce that is covered in old oil based paint lasts! One challenge with this kind of job is what to keep and what to tear off. The other big challenge is working with how the old structure has moved and shifted to bring all of the areas together nicely when the scope of work does not include re-leveling and squaring the whole house! When it is complete the house will be painted in it's classic barn red color. 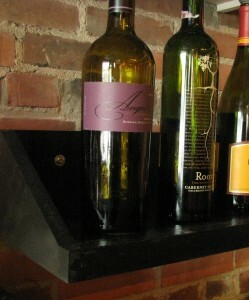 Built-in cabinet job for a restaurant in Montpelier. 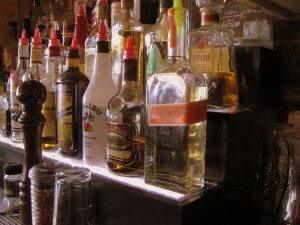 Building and installing cabinets, liquor shelves and floating shelves for the back of the bar in a local restaurant. This job was done on a very tight schedule. Only1 1/2 weeks start to finish! Used solid maple doors for the glass front wine cabinet and Purebond formaldehyde free plywood for the other doors and the cabinets. 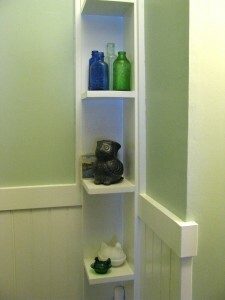 Shelves constructed from pine and painted black with Benjamen Moore Aura paint. This month has been a steady progression of small jobs with a few periods of rest and enjoying the snow! We have been working on a built in closet bypass door installation and a partial kitchen remodel. The kitchen client wanted a dishwasher so we removed the old metal sink base and replaced it with a smaller sink base and dishwasher. The new counters are Cambria. The backsplash is subway tile. Pictures coming soon. Renovation of half bathroom in progress. Bathroom is about 4'x4' with a 2'x2' little alcove in it. The sink above is in the little alcove. My favorite thing about this style of toilet is how easy they are to clean since the base is all one solid plane. 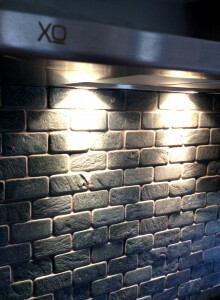 Have also installed 12" Vermont slate tile. The new wainscoting is clear pine painted white. Renovation of full bathroom. White subway tile for tub surround and wainscoting. Black stripe continuous around the room. This great little heater unit is made by a company called Envi that we installed in a small (6x7) mudroom addition from this winter. It has a built in thermostat and works as a convection unit, drawing cool air from below and sending it up to create a circular air flow and maintain a consistent room temperature. We also put in a well insulated and air-sealed entry door in a stairwell to replace a cold and drafty old hollow core door. 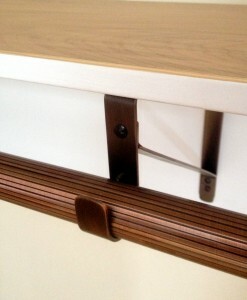 The door trim is fir to match the existing older trim. 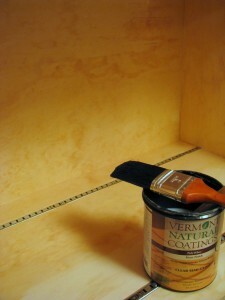 True Colors paint store in Montpelier did a fantastic job doing a stain match to the old varnished trim. We have been working on several projects through the winter. Pictures coming soon. First... It seemed like it was never going to snow and then...tire chains are required to pull the trailer out! For the homeowner in the winter it may be "some hiking required". Have been working on framing, capping and finishing a walk-out basement on an existing foundation. It was originally to be a whole house but the bank said no to the borrower. Luckily she was able to get financing through a special program for low-income borrowers. She will do much of the finish work. Radiant heat in the slab and a beautiful view of the hills through five 25x74 fixed glass low-E units should create a cozy home. They did. The owner is in and enjoying the view. Currently two jobs are nearing completion. One is a small mudroom/bathroom addition inside the garage. The other is a reconfiguration of a 600 ft2 mother in-law cottage. More details and pictures soon. The second floor of this house was torn down to framing and reinsulated with closed cell spray foam. New LED light fixtures and some new wiring. Local spruce boards on the slopes and ceiling. Built-in shelving. It seemed like it was never going to snow and then...tire chains are required to pull the trailer out! For the homeowner in the winter it may be "some hiking required". Have been working on framing, capping and finishing a walk-out basement on an existing foundation. It was originally to be a whole house but the bank said no to the borrower. Luckily she was able to get financing through a special program for low-income borrowers. She will do much of the finish work. Radiant heat in the slab and a beautiful view of the hills through five 25x74 fixed glass low-E units should create a cozy home. Second floor of an old house converted into an office building in Montpelier. Dividing space, designing and building new access, reinsulating and general renovation. After demolition it turned out that the old rafters were grossly undersized and had about 6-8" of deflection in them. Mike Beganyi helped with drawings and ideas for shoring up the structure. We have built all of the interior partitions and completed the stairwell. All of the interior walls are soundproofed. The space has been reinsulated to modern standards with dense pack cellulose. Windows were replaced with new Marvins. More posts of past work. This frame was hand cut from white pine in 2005 and raised a few months later in January of 2006.